Recently, there’s been a little bit of talk among science bloggers about the need to murder your darlings. Christe, Carl and Ed are talking about excising some of your favourite passages of writing in order to let a whole post hold together, but I’ve been thinking about the phrase in a different context recently. I’m an invertebrate evangelist, and I utterly fail to understand how most people manage to package all the world’s invertebrates into one giant and creepy category. But no matter how much you love bugs, you have admit some of them are just pests that need to be dealt with. Lately our garden has been taken over by wasps. That’s “wasp” in the every day sense in New Zealand, the murderous little yellow and black flying insects; we have thousands of native wasp species but they are all solitary and most are small and limited to native bush, so they don’t really enter our consciousness. The German Wasp and its cousin the Common wasp (Vespula germanica and V. vulgaris), are something quite different. They are both social insects that build nests that support thousands of workers, each of which lives to bring up their queen’s brood. Unlike honey bees and bumblebees, where the workers collect nectar and pollen to feed their young, wasp larvae need flesh. 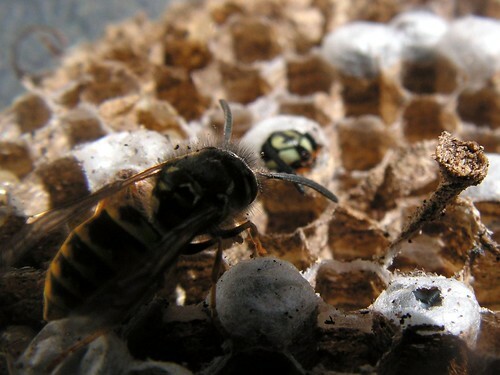 In late spring, the first generation of workers leave the nest and start collecting insects (especially caterpillars it seems) to feed to the developing larvae. The adults feed on nectar, but in the start of the season they are mainly sustained by a sugary substance the larvae produce in return for their food. In the middle of summer adults spend more time looking for their own food outside the nest, and that’s why we start noticing them around fallen fruit and picnics come December or so. There is nothing quite like these introduced wasps in the New Zealand fauna. The relative nativity of our insects, the lack of any predators and our relatively warm winters (which don’t kill-off the nests every year) mean these wasps live at much greater densites in New Zealand than they do in Europe. 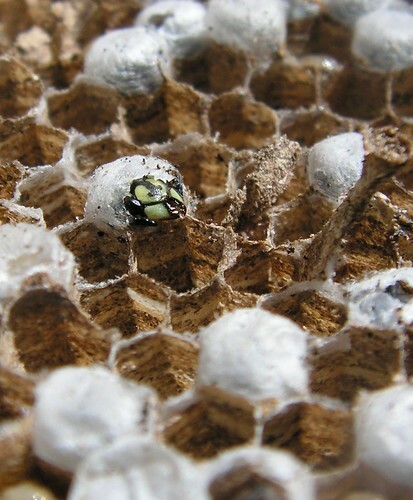 In native beech forest, especially sourthern forests that produce honeydew thanks to native scale insects, there can be as many as ten thousand workers in one hectare, that’s one wasp for every square metre of forest. In beech forests in particular, wasps are a complete disaster. They can wipe the forest floor clean of native insects and spiders and monopolise the honeydew, which is an important source of energy for native birds. Indeed, if you were to weigh all the wasps in some sections of native forests it would add up to more than the combined weight of all the native birds. In urban and rural settings wasps are a pain (literally, I was stung by one as a child and remember it well). So, as opposed to almost every other invertebrate that crosses my path, when I see an introduced wasp I get just a little sense of revulsion. When i tracked down the the source of our graden’s yellow and black plague to two different nests on our property I hardly thought twice before I bought a bottle of carbaryl to deal to them. The first nest was no problem, it was dug into our clay bank and had a nice clear entrance site that I could sneak up to at night – letting me cover the entrance with the poisoned powder. The other nest was tougher.The entrance to that one was obscured in amongst a compost pile, right next to some weedy flowers which are visited by honey, bumble and and even native bees. Carbaryl is a broad-spectrum insecticide, and bees are having a hard enough time without being caught in the crossfire of this war, so a scorched earth policy wasn’t really an option. Instead, I got a long sleeved shirt* and a spade and began to excavate the entrance to the nest. This process basically involved me clearing away a little of obscuring material before dropping the spade as a bolt of WHITE-HOT ADRENALINE passed through my body as a single wasp flew in roughly my direction for a little while. Quite a few rounds of this process ended when the last blow of my spade revealed not the entrance to the nest, but the very middle of it. I’d cut a wall of the nest open and revealed a swarming yellow and black mass of wasps (who were more interested in attacking the spade than me) and the cells they’d constructed to house their young. Once the initial buzz had died down, I managed to extract the section of the nest that I’d dismantled and in doing so I learned something. Wasps might murderous, stinging invasive pests, but they’re also quite beautiful. In all the time I’d been cursing their presence in my garden, they’d built an incredible piece of architecture out of the weeds we’d thrown away. My photos hardly do their efforts justice, but you get an idea. One of the very few spineless creatures that I thought had no place in my heart had really amazed me. Beautiful as their creation might have been, they are still a pest and later that evening I came back to their now exposed nest and killed them, but it was a much more difficult job than the first nest. If you want more posts dealing with ravenous hordes of social insects, Alex Wild at Mrymecos declared last week “Army Ant Week” and celebrated by producing some of the most wonderful photographs and interesting posts you’re likely to find. We’ve just approached (very cautiously! – like you I have unpleasant memories of being stung by a wasp as a child) & deleted 3 paper wasp nests that appeared around our place over the last 2-3 weeks. The nests are lovely structures but I just don’t tolerate having the adults around picking off every little invertebrate that moves. Before we twigged to what was happening & took steps to shield the plants with netting, they’d regularly clean out all the Monarch caterpillars on our swan plants, back at our old house. Those cells are extraordinarily beautiful, even more so than waxy honeybee cells. Thankfully, paper wasps are one pest we don’t have to worry about this far south (a saw one for the first time a couple of years ago in Masterton, so perhaps they’re headed south). High praise indeed coming from a bee 😉 I only wish someone with a better camera or (more importantly) more skill had been on hand to record them.